I know I'm not alone in my excitement over fall's imminent arrival. It's my absolute favorite season of the year! Here in South Texas, the scorching, end-of-summer heat will linger a bit longer, and I always look so forward to the cool, autumn weather. After suffering through the recent, sweltering weeks, the crisp, breezy fall days will be like heaven-on-Earth for me. The upcoming, chilly days will open the door for my family to enjoy some of our favorite things. To start with, my favorite things to wear are jeans and boots. In fact, I've already dusted off my favorite pair of Roper's and they're ready for action! And, hopefully it won't be too much longer before we get to bundle up in sweaters and watch the kids play in huge piles of fallen leaves outside. We also can't wait for bonfires, homemade hot cocoa, s'mores! In October, we visit some local, church pumpkin patches and then there is all the spooky, Halloween fun to anticipate. Plus, October is my birthday month! Unlike many people, I really look forward celebrating my birthday, even if it's just an easy dinner and cake at home. Back on the first day of September, wheelbarrows full of plump, orange pumpkins and mysterious-looking gourds were put out for display at our local grocery store. Accordingly, the gorgeous array of rustic, harvest colors are taking over in every other store too. It really sets the mood for the onset of the pumpkin-flavored-everything-season, doesn't it? Well, it does for me. Are you excited, yet? This is the first, and definitely not the last of the pumpkin-loving recipes I'll be posting. ** Special equipment needed before you start: toothpick, fork, pastry brush, wooden spoon. 2 tsps of each, cinnamon and sugar, combined for dusting. 1. In a large bowl, combine all the ingredients for the filling and set it aside. 2. Combine the flour, salt, sugar and baking powder in another large bowl. 3. Using yours hands or a pastry blender, mix the shortening and cold butter into the flour until it looks like coarse meal. 4. Using a wooden spoon, mix in the beaten egg and the ice cold water until a shaggy dough forms. Turn it out onto a lightly floured surface. Knead lightly until the dough comes together. Cover with plastic wrap and refrigerate the dough for 30 minutes. 5. Pre-heat your oven to 350°. Using large pieces of the pastry dough, roll it out to about 1/8 of an inch thick. Using a four-inch, round cookie cutter, cut your rounds. 6. Fill the center of each round with a heaping teaspoon of the pre-made pumpkin filling. Dab your finger in water and lightly wet the edges of the pastry cut-outs. Fold in-half to seal. 8. Place your prepared empanadas onto a large cookie sheet covered with parchment paper. 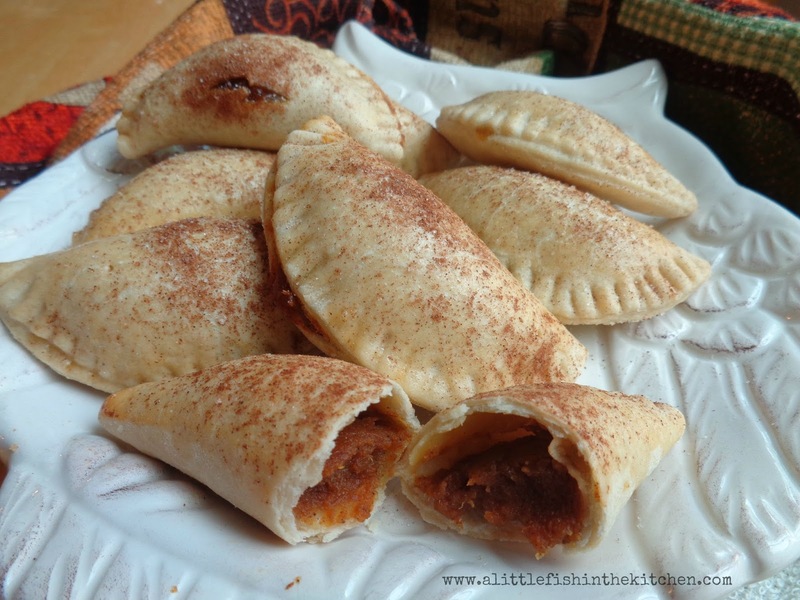 Brush each empanada with the egg wash and then sprinkle with cinnamon and sugar. 9. Bake for 20 minutes or until pastry is lightly browned. Remove from oven. That filling will be steaming hot, so allow to cool on a cooling rack for 20-30 minutes before taking a bite! 10. Pour yourself a cup of coffee and enjoy! 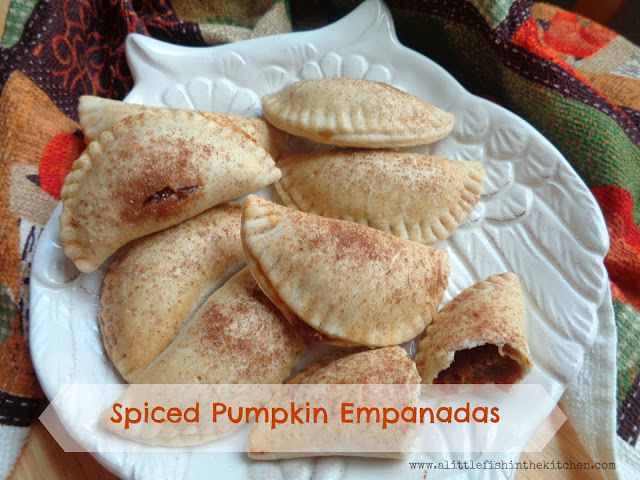 I love a good pumpkin empanada, Marcelle, and I really like your dough for these, too. I think I know what I am doing this week! Happy almost birthday! Hi David! Thank you! I hope you enjoy them if you make some, we sure did! Hello Cheri! Thank you! Can't wait until these crazy, hot temps drop! i'm SUPER picky about pumpkin and don't like it in most forms. i can't deny how awesome these look and sound though--great idea and execution! Thank you, Grace! I'm definitely a member of the "pumpkin everything" team. :) Thank you so much for stopping by.